The KH-1 (Keyhole-1) was the first attempt in the Corona-program to build an optical reconnaissance satellite. These satellites were all launched under the name Discoverer. 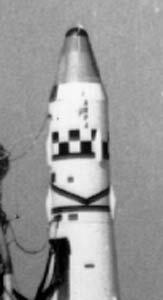 The KH-1 payload consisted of the C (Corona) single panoramic camera and a single General Electric return vehicle (SRV, Satellite Return Vehicle). The C-camera was built by the Fairchild Camera Co. and with a f/5.0 aperture and 61 cm focal length had a ground resolution of 12.9 m.
The satellite was based on the Agena-A upper stage, which provided attitude control in orbit. The film return capsule carried its own small solid-fuel retro motor to deorbit at the end of the mission with mid-air recovery of the returning capsule by a specially equipped aircraft. After testing the basic vehicle without camera and return capsule on Discoverer 1 and only with SRV on Discoverer 2 and 3, ten KH-1 satellites were launched, but only one resulted in a successful return of film. Three missions failed to orbit. When the first eight missions failed to return the capsule successfully, two more Discoverers without imaging payload (Discoverer 12, 13) were launched. After that, KH-1 9 was finally successful resulting in the only return of film during the KH-1 series.